COLORBOND® fencing products look stunning and can withstand the test of time in the harsh Australian weather. Plus, choosing to build with COLORBOND® products offers long term cost effectiveness through not having to replace, re-paint traditional timber fence palings. We specialise in designing, building and installing a wide range of gates to match your new COLORBOND® fence. Find out how we can finish your project with a bespoke gate to suit your needs. This premium range offers the unique aspect of having identical aesthetics on both sides which gives the perfect appearance on either side of the fence. The design of the ribs closer together gives the Metline range more strength and endurance. If you require a different height or width from the standard give us a call as we can customise any of the COLORBOND® products to suit. This Metline range offers the unique aspect of having identical aesthetics on both sides which gives the perfect appearance either side of the fence. The design of the ribs closer together gives the Metline range more strength and endurance. If you are looking for an aesthetic that is a little different the Metzag range will suit your personality and your property. 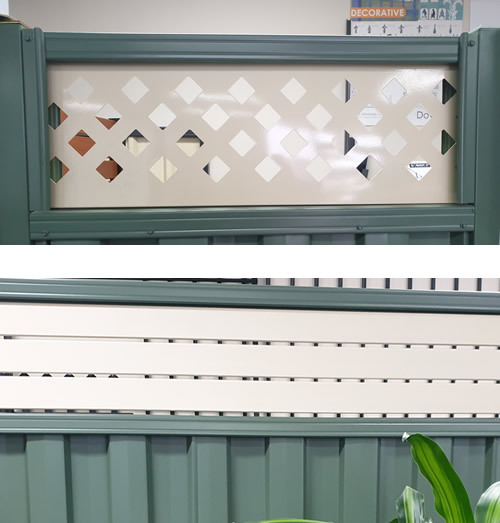 This style also has COLORBOND® original outlook of being identical on both sides which gives the perfect appearance on either side of the fence. COLORBOND®S traditional fencing style. It is strong and durable and perfect for any fencing need. The Trimclad fencing range will suit any low maintenance fencing requirement. The Corodek range of fencing panels has the outlook the replicates corrugated iron roofing panels. It offers a strong aesthetic look for a tough fencing option. 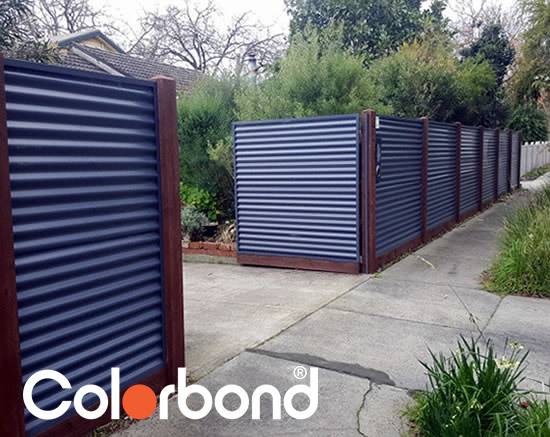 COLORBOND®S mini Corodek range is the most flexible option for fencing, as the profile is small therefore it can be erected either vertically (as per normal) or horizontally to add an extra element to your fence. The versatility of this style also offers the panels to be erected flat or it can be bent around corners. We can also install slotted lattice panels or horizontal slat panels that can be used for lattice extensions to the top of a fence. The panels are 300 mm high and sit framed on top of a Colorbond fence panel. They come in all COLORBOND® colours. We construct the frame using strong and durable materials we then insert the COLORBOND® panels to match the rest of the fence.